It didn't take too long for us to cross over the river back into Arkansas. 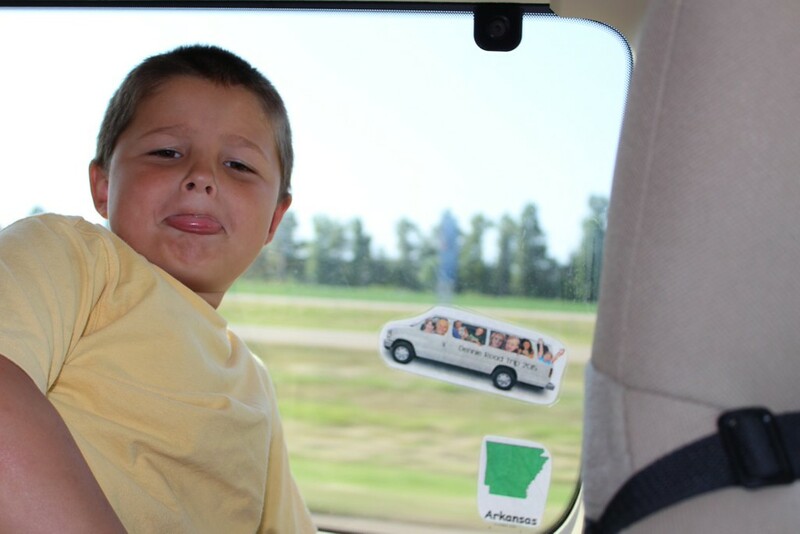 Graham moved the Dennie van picture back to Arkansas as we rolled along the road. Robby and I spent the ride home trying to figure out how we will survive the week with 3 kids at the same day camp but leaving and arriving 15 miles apart along with getting resettled at home, unpacking (which will be done today) and then starting school in 2 weeks! And then my aunt brought me 5 bins of clothes when she passed through town right before we left so I plan to go through those as well. Busy week ahead but we do love a challenge! Before we could actually come home, we had to run by the grocery store to pick up a few things needed for the week. I just walked by the freezer section all sad like thinking about my freezer food at home....while we were gone, an outlet messed up and our freezers thawed out! Poor Grannymom and Grandpa had to deal with all of that mess-my fridge and deep freeze were completely full of things. They had to work and work to clean everything out-what a mess! I will have to work now to fill that freezer back up! We picked up a pizza on the way home and ate it at Nonna's house before heading home. When we made it home, we first unloaded the car and moved everything to the mudroom. Then we worked on the van-Robby took all of the seats out and that is a huge job. He then started vacuuming the floor and I had kids cleaning the windows, scrubbing the seats, cleaning the doors, vacuuming and on and on. Once the car was clean the kids tried to help us unpack some. They were decent help but after I gave them a break, they never returned. We finished in time for Robby to give the boys a hair cut (which ended up in mohawks for camp week) and then the Wilsons came over.